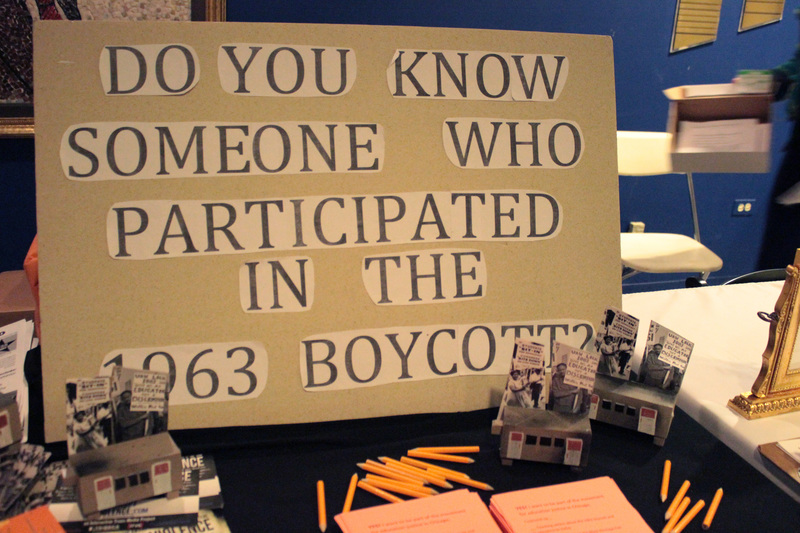 Updates from the production of our forthcoming documentary, '63 Boycott. We'll be posting production stills, press clippings, and project milestones. This entry was posted in Blog, Production Updates on February 19, 2014 by '63 Boycott. Yesterday, we interviewed the inimitable Timuel Black for our upcoming documentary on the 1963 Chicago Public School Boycott. 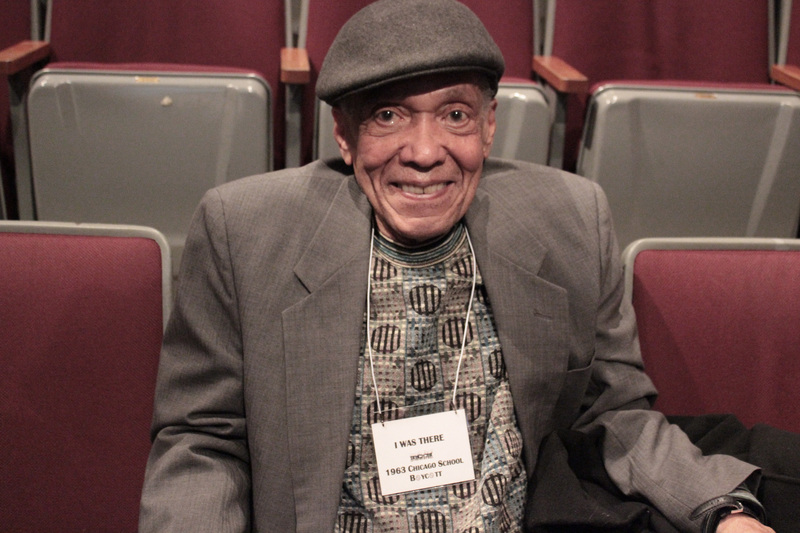 Timuel Black is a revered educator, historian, and activist who helped organize the Boycott. Particularly, he helped with the “Freedom Schools,” makeshift classrooms in churches and synagogues throughout the city with Civil Rights-based curriculum for students who were boycotting school. 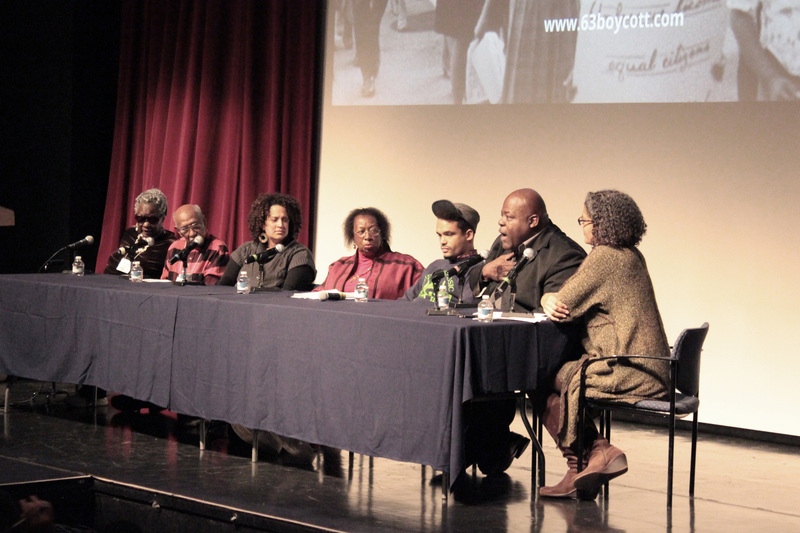 Timuel also participated on the panel at our 50th anniversary celebration of the 1963 Boycott. Check back for more updates on our film’s progress! This entry was posted in Blog, Production Updates on February 12, 2014 by '63 Boycott. Many thanks to Dr. Nicole Holland for inviting us to screen our work-in-progress cut last night at Northeastern University’s Dr. Kenneth N. Addison Lecture for Multicultural Education and Social Justice! The event follows close on the heels of another Boycott WIP screening for students at Young Chicago Authors and DePaul University. 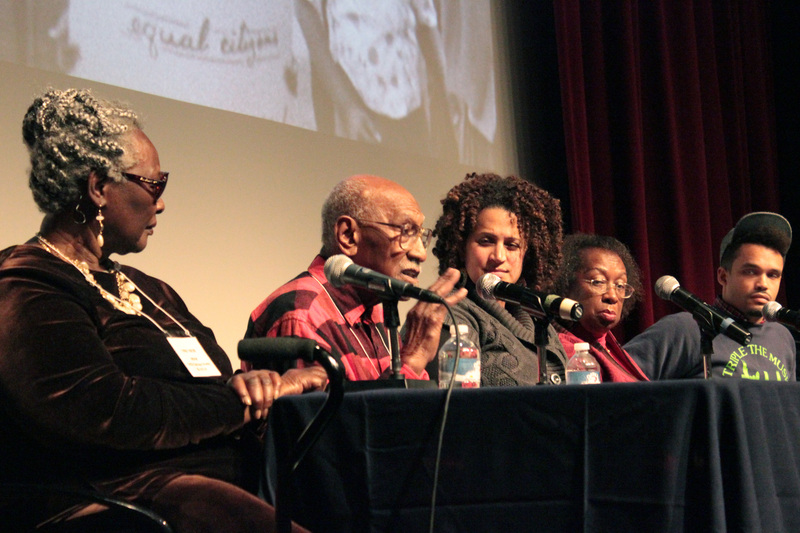 Last night’s screening was followed by an engaging panel discussion featuring participants in the ’63 Boycott and today’s education activists. Click here to read the program. This entry was posted in Blog, Production Updates on December 17, 2013 by '63 Boycott. 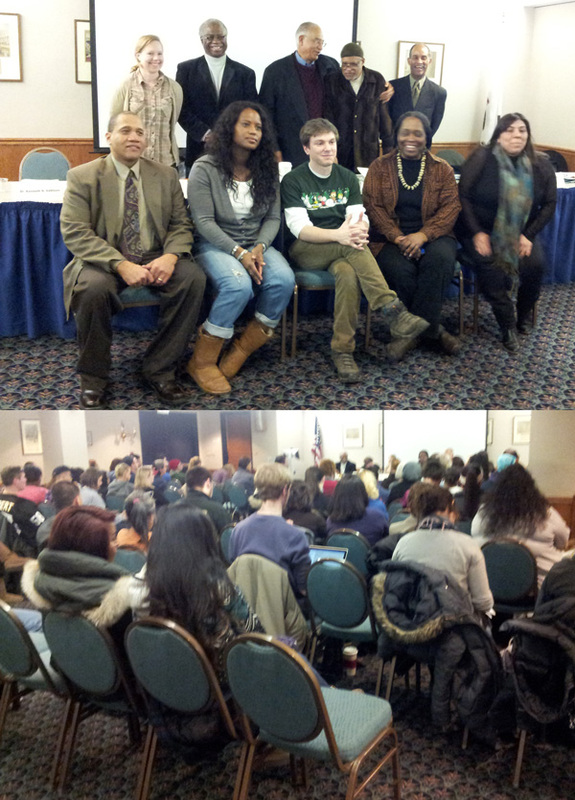 Here’s the video from our event, Lessons from ’63 Boycott: The Struggle for Quality Education in Chicago Then and Now. Panelist names and descriptions below the video. Lessons from ’63 Boycott was held at the DuSable Museum of African American History on October 22nd, 2013. 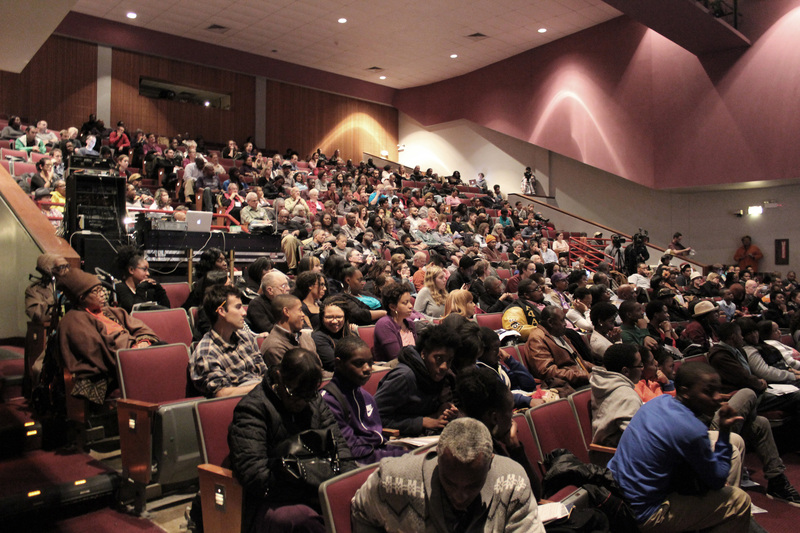 The event drew over 450 people. Tell us what your favorite moments were from that evening or from the panel in the comments box below! 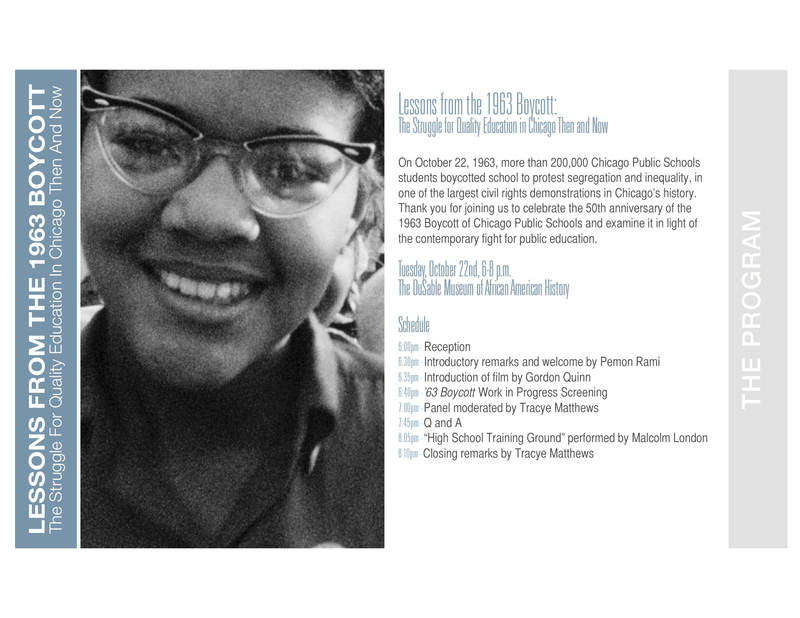 In 1963, Rosie Simpson was the mother of six young children and a leader in education reform in Chicago. She is believed to have coined the phrase “Willis Wagons” to describe the trailers that then-superintendent of schools Benjamin Willis set up for black children instead of sending them to white schools. She was one of the lead organizers of the 1963 Boycott and went on to work for the Packing House Workers Union, The Woodlawn Organization, and the Urban League. 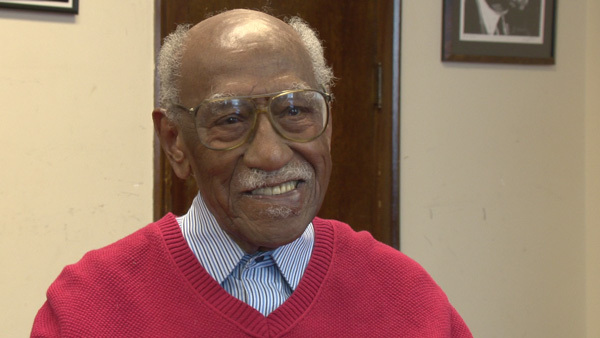 Timuel Black is a revered educator, political activist, community leader, oral historian, and philosopher, born in the south and raised in Chicago. He is a pioneer in the independent black political movement and coined the phrase “plantation politics.” Dr. Black is among the original organizers of the 1963 Boycott of the Chicago Public Schools. He was chosen to organize the Chicago contingent of the two “Freedom Trains” for the 1963 March on Washington for Jobs and Freedom. Fannie Rushing served as a Student Nonviolent Coordinating Committee (SNCC) field secretary and Freedom School teacher from 1962 to 1966. Rushing is currently an associate professor in the Department of History at Benedictine University and the Co-Chair of the Chicago SNCC History project. Elizabeth Todd-Breland is an Assistant Professor of History at the University of Illinois at Chicago. Her teaching and research focuses on 20th-century U.S. urban and social life, African American history, and the history of education. Her book manuscript, tentatively titled A Political Education: Black POlitics and Education Reform in Post-Civil Rights Chicago, analyzes transformations in Black politics, shifts in modes of education organizing, and the racial politics of education reform from the late 1960s to the present. Jasson Perez is a Chicago-born organizer and former student of Chicago Public Schools. As a high school dropout and formerly incarcerated youth, Perez discovered on a personal level what’s at stake when schools become a pipeline to prison. Perez worked as a labor organizer with SEIU Local 73, working with the support staff at Chicago Public Schools in the fight against school closings since 2004 when CPS announced Renaissance 2010. He currently serves as Co-Chair of BYP100, Black Youth Project’s nationwide network of one hundred young black activists working to build a transformative justice movement that centers on a feminist, queer, differently-abled, and decolonial praxis. Jitu Brown is the education organizer for the Kenwood Oakland Community Organization (KOCO). Born and raised in the Rosemoor neighborhood on the far south side of Chicago, Jitu attended Wendell Smith Elementary School and Kenwood Academy High School. Jitu also teaches African-American history at St. Leonard’s Adult High School. A believer in working locally and thinking globally, Jitu has taken youth leaders from KOCO to the United Nations, to the Passamaquoddy Native American reservation in Maine and to the UN Conference on Racism in South Africa. He has been published in the national education magazine Rethinking Schools, appeared in Ebony magazine and on several talk shows, including WBEZ’s Community Voices, Democracy Now and CLTV’s Gerard McClendon Live. Trayce Matthews (moderator) is a historian, curator, and documentary filmmaker. She is currently the associate director of the Center for the Study of Race, Politics, and Culture at the University of Chicago, where she served as a Mellon Postdoctoral Teaching Fellow in 2004-2005. Matthews is the co-producer of ’63 Boycott. 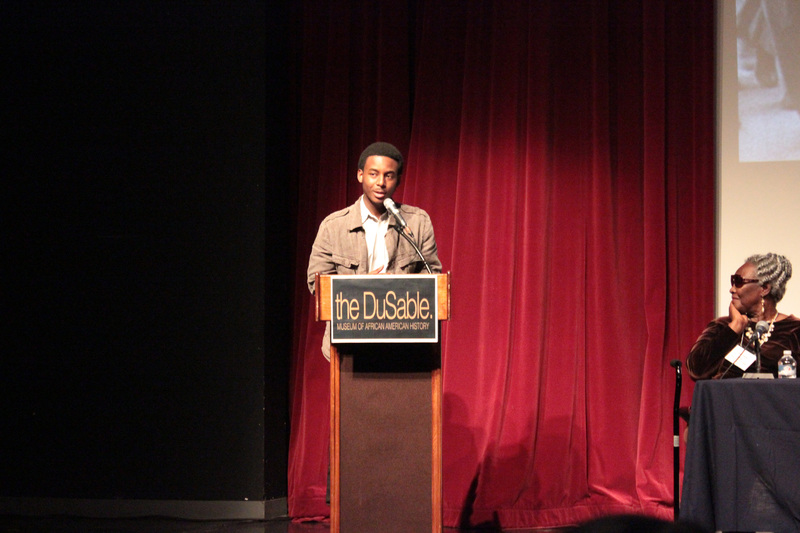 The spoken word piece “Multiple Choice” was performed by Malcolm London. Malcolm, called the Gil-Scott Heron of this generation by Cornel West, is a young Chicago poet, activist, and educator. Winner of Louder Than A Bomb Youth Poetry Festival 2011 and member of UCAN’s National Forum on Youth Violence Prevention, he is a teaching artist through Northwestern Bluhm Legal Clinic and Young Chicago Authors introducing poetry workshops and performances linked to juvenile and social justice to hundreds of youth. This entry was posted in Blog, Boycotter Stories, Production Updates on November 1, 2013 by '63 Boycott. The boycott’s point was to protest the intentional segregation of Chicago schools and the unequal treatment of the black schools—which then warehoused half the school population. Today, with the white school population around 10 percent, anything resembling integration is virtually impossible, but unequal treatment persists—as witness the closings of 49 black and Latino public schools with more to come. 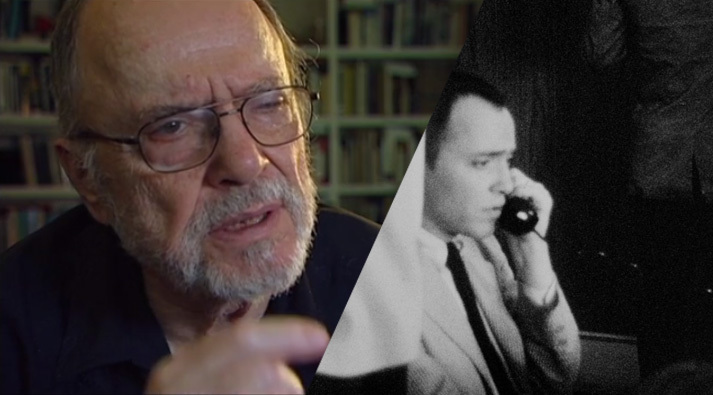 As part of his media strategy, Don wrote “These Schools Are Your Schools” to the tune of Woody Guthrie’s “This Land Is Your Land” and had folk musicians record the song, which he then broadcast on the radio and from sound trucks to promote the Boycott. Listen to that song, which he references in the article. This entry was posted in Blog, Production Updates on October 24, 2013 by '63 Boycott. We’ve compiled all of our live Tweets from the DuSable Museum event below. They mostly focus on our post-screening panel, which included Boycott participants Rosie Simpson, Dr. Fannie Rushing and Dr. Timuel Black; historian Elizabeth Todd-Breland; and contemporary education activists Jitu Brown of KOCO and Jasson Perez of Black Youth Project. 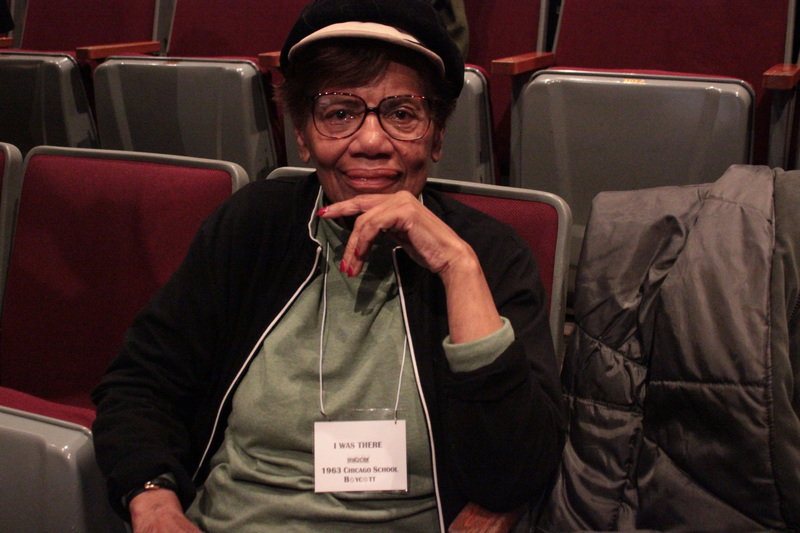 The panel was moderated by University of Chicago professor and ’63 Boycott Co-Producer Tracye Matthews. Enjoy! To see the whole program, click here. 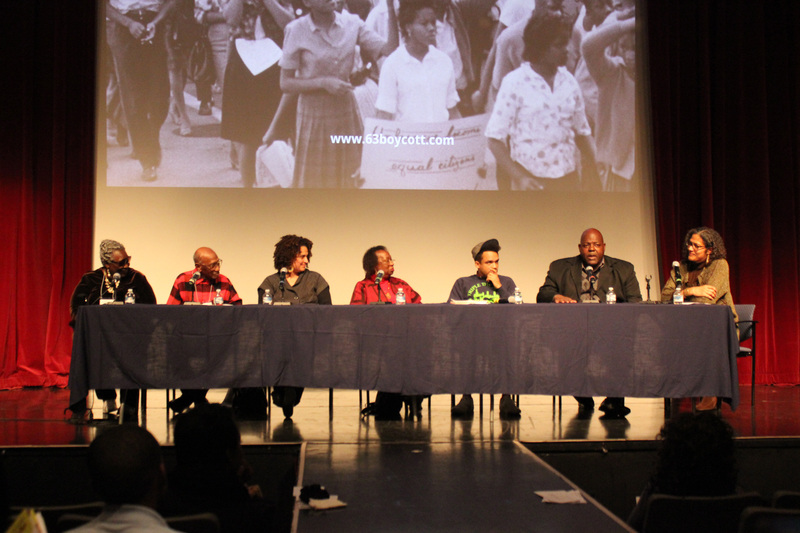 Thanks to everyone who came to Lessons from the ’63 Boycott at the DuSable Museum! What an incredible turnout. We’ll be posting footage of our panel later this week. In the meantime, enjoy these photos. This entry was posted in Blog, Production Updates on October 23, 2013 by '63 Boycott. This entry was posted in Blog, Boycotter Stories, Photos and Documents, Production Updates on October 22, 2013 by '63 Boycott. 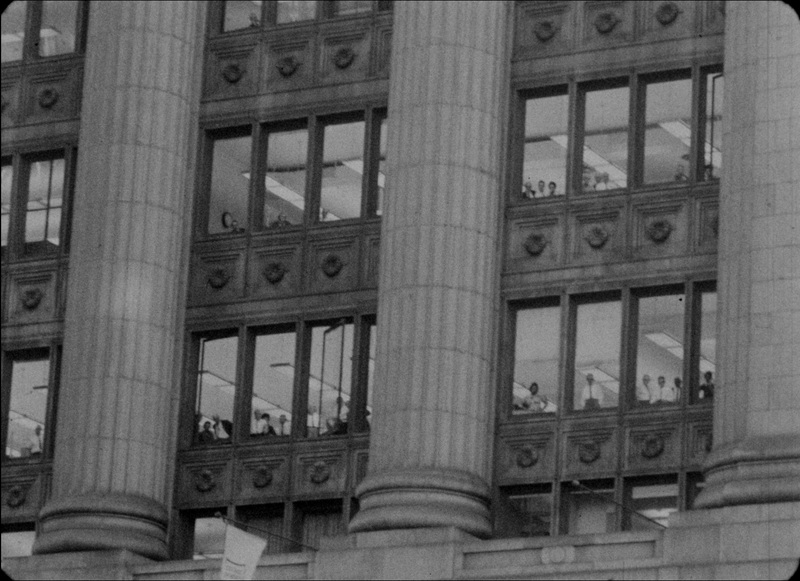 At about 3:30 pm on October 22, 1963, march captains from all corners of the city would have been leading thousands of people to the protest downtown. Many of the protestors would have been students, protesting the conditions at their school. 50 years ago today, students who chose to boycott school were given the option to attend Freedom Schools, makeshift classes set-up by education activists primarily in churches, temples and synagogues. The curriculum was Civil Rights themed, and activities included historical skits, Freedom Songs, and painting picket signs for the rally downtown later that afternoon. Below is some of our footage from one of the Freedom Schools, taken (we believe) at the KAM Synagogue, now the headquarters of Rainbow PUSH Coalition. If you recognize anyone or have any further information about this Freedom School, contact us through our site. This is the first time we’re releasing this footage – it has spent most of the past 50 years in a box. Enjoy!